College Savings Fund: Is an ESA or 529 Plan right for you? It is finally time to start a college savings account for Ella. I thought starting a college saving plan would be simple. I assumed I could open an account anywhere, choose a few mutual funds and I was up and running. If you want to qualify for federal tax benefits, it isn’t quite that simple. I meet with our financial advisor and did a ton of research online. Below is a brief summary of each plan. Each of these accounts has negatives and positives. I’ve outlined how each account works below and then listed the negatives and positives about each account. I recommend using this information to make your basic decision and then meet with your financial advisor prior to finalizing your plan. I highly recommend speaking with a financial advisor before making a final decision. I am not a financial advisor and definitely not qualified to give financial advice. 529 College Savings Accounts are managed and founded by states or educational institutions and are designed to help families put aside funds for college-related expenses. They are named after Section 529 of the IRS code. Funded with post-tax money, so all interest earned is tax-free if used for qualified expenses. Think of it as a form of Roth IRA. Proceeds must be used for tuition, room board or other college-related expenses. Money can be withdrawn without penalty if your child gets scholarships, becomes disabled or dies. You own and control the plan. Change to the name of a beneficiary can be made at a later date. This make is easy to pool funds to be used for multiple children. Money can be used to fund your own future college plans. I love this feature since eventually, I’d like to return to school for a doctorate degree. Falls under the gift tax exclusion, which is currently $13,000 per person. This means you can accumulate a lot of money fairly quickly if you have that type of cash on hand. You’ll need to check your individual states, but in Arizona, you are allowed to deduct a maximum of $4,000/$2,000 (married/single) from your annual taxable income for state income tax purposes when contributing to any qualified 529 plan. You can check out this website by Archimedes to confirm your state has similar provisions and calculate your approximate tax savings. Managed by whatever state 529 plan you choose to use. This could be a benefit if the state plan is well run, but means you are limited to the options and funds that the state has chosen to allow. Please note that you aren’t limited to your own states 529 plan. You can live in Arizona, open a Florida plan and your child can attend college in Nebraska as long as it is a federally recognized plan and college institution. Investment options are often limited. Since I live in Arizona I decided to research the Arizona plan and wasn’t impressed. In Arizona, I can only open 529 college savings plans through Fidelity, College Savings Bank and Ivy Investments. When I went to the Fidelity plan I had two options. Most funds push the age-based investing. The strategy utilizes a more aggressive portfolio until the child nears college age at which point the plan will switch to a more conservative approach. You can review their fund performances here, but overall the results weren’t stellar. The other two plans available in Arizona were very limited as well. The College Savings Bank was just like it sounds. It was CD and Saving account options. At .90% that is a big waste of time and money. Ivy Investment group offered 16 individual plans, 3 age-based plans, and 3 static portfolios. Again I was less than impressed with my options. Please note that I only reviewed the Arizona state plan. Your plan may offer additional benefits that aren’t available through Arizona. It is important to note that you aren’t required to stay within your state when opening plans. You can participate in other state plans. Do your research on your individual state account since each state laws may vary slightly. Any prepaid tuition plans are managed under 529 plans. I personally am not interested in prepaying for tuition since I have no idea where my kids will be going so I didn’t do any research in this area. Depending on your personal situation and state this may be a negative or positive. Like a 529 Savings account an Educational Saving Account is designed to facilitate tax-sheltered savings for educational expenses. 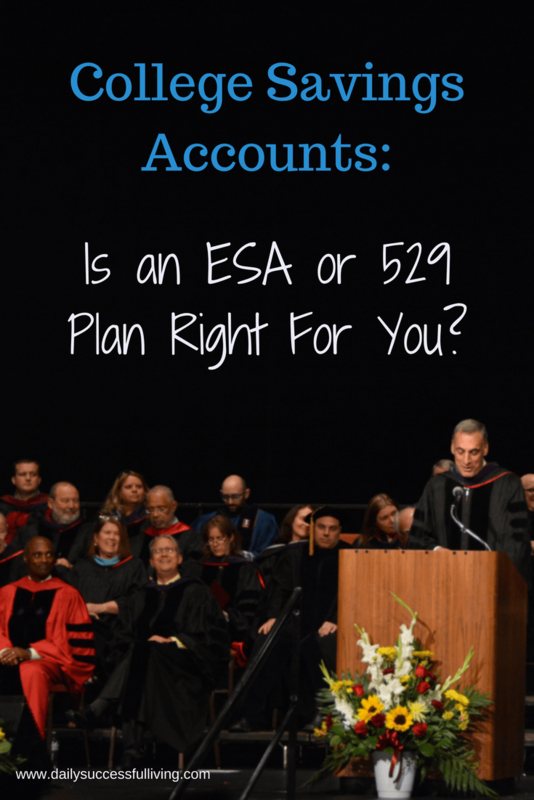 Unlike the 529 accounts, the ESA can be used for K-12 educational expenses. Funded with Post Tax money, so all interest earned is tax-free if used for qualified expenses. Ability to control the account when beneficiary turns 18 if you set up the provision when opening the account. This is one of the most important features to me. I’m sure Ella will be a great child, but I’m not planning to hand her control of a bunch of money at 18 and expect her to use it wisely. Funds are not limited to college expenses. ESA money can be used for K-12 grade educational expenses. I know a lot of people who set up ESA funds to take care of private/charter school expenses and then use 529 savings accounts for their actual college funds. More investments options than a 529 Savings account since the funds are not controlled by a state entity. Think of them as an IRA account that can be opened through virtually any brokerage firm. Money is considered a parent’s asset rather than a child’s so will have minimal impact on financial aid. Currently limited to $2,000 annually. Income limits for contributions. ESA contributions begin to phase out if you make more then $220,000/$110,000 (Married/Single) annually. If you have family members contributing to your child’s ESA account you need to keep track of contributions and insure you don’t over contribute. Complicated to switch funds to another individual, but can be done. Student must be enrolled at least half-time to qualify for college related distributions. It depends on your and your personal situation. At this point I’m 90% sure I’ll open an ESA account. I’m not planning to contribute more then $2,000 to Ella’s fund for the next couple of years so the contribution restrictions don’t matter. I like the increased flexibility that the ESA accounts offer. I’m not an expert at picking stocks, but I’m good enough to where I feel that I can do better with my own chooses then the limited options available in the 529 plans I researched. Based on the offerings for the Arizona 529 plans I know that I wouldn’t be happy with my investment choices. Your decision may be completely different. If you have more money to contribute then the 529 options are significantly more appealing. If you want to put everything on auto pilot and let the brokerage firm choose your investments based on age then 529 plans are your best option. Every person has a different risk tolerance and skill level when it comes to investing. I recommend reviewing your personal situation with your financial advisor and then coming to a decision based on your individual situation. The plan you choose really isn’t the most important detail. What matters is that you start saving today. One of my top personal financial goals is to open college saving funds for Ella and my two grandkids. Although the contributions will be limited for the next three years while we work on paying off our home, I personally believe that getting started is the most important step. It doesn’t matter how old your child is, when it comes to college expenses every little bit helps. PS. The picture is from an ASU Law School Commencement Address done by John Shufeldt. He just published a new book called LeadershipYou that I highly recommend reading. Did you happen to look at options for mission funds? We wanted to put aside an amount that can be used for either mission or college but when we look at most savings plans they have penalties to withdrawal for anything other than college or they are just regular savings plans. Have you seen or heard of anything that they could use for a mission? By the way, I am really enjoying your posts, they’ve gotten me to really focus on getting our family finances to a more healthy situation and pay off our debt!! I had never even thought about a safe place to store funds for a mission. Let me do some research and get back to you. I highly doubt there is anything available on a tax-deferred basis. I kind of think you are stuck with a regular savings account. Probably your best bet is to find a good online bank with high (which is a relative term) interest rate. Let me see what I can find – Great question. I’m so glad you enjoy the posts and that they help you! I see pictures on FB periodically of you and your family and it makes my day. Your kids are adorable!